So you may recall several times in the past I have dipped my toe into podcasting. If you actually listened to any of them you know they weren’t great. I think it is very tough to do that sort of content solo. However with the advent of the EUC live stream show I am doing with Marty, the idea once again popped into my head that it would make for some good podcast content. I also got around to recording my 4000 YouTube Subscriber thank you video, something I wanted to do for a week or so. It’s a short, simple video that expresses my gratitude for the support I have been given which has resulted in a 33% increase in subscribers in the last 6 months. I also shot another quick video talking about my One Wheel being out of commission until a replacement front footpad sensor is sent to me. Luckily I have a new vehicle rolling into the collection today. My Meepo electric skateboard is supposed to show up today which should be yet another learning experience. I am hoping Cindy and I get to test it out at the school after work. So once again Florida is in the middle of a red tide nightmare. This happens all the time and is the end result of environmental abuse, lobbyist dollars, and the government officials beholden to those dollars. The Cliff Notes version is Lake Okeechobee in the middle of Florida is hopelessly polluted from fertilizer run off, much of which is from US Sugar operations. In the past water from the lake was able to be naturally filtered as it flowed south through the Everglades. Well development and US Sugar operations changed all that. The majority of that run off is now artificially routed east and west through two rivers, bypassing that natural filtration system. 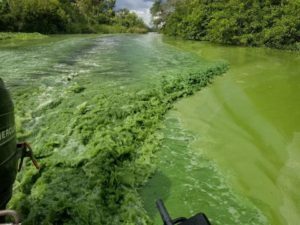 The end result has been horrid and toxic algae blooms that turn the water, green, then red, and then black with the corpses of dead fish and marine life. It’s outrageous that this has been allowed to go on for so long but as in most things, lobbyist dollars have the ability to outlast people’s outrage. You can read a full account of the situation here.